The Toronto Star has offered a concise, to the point, editorial on The Autism Problem. 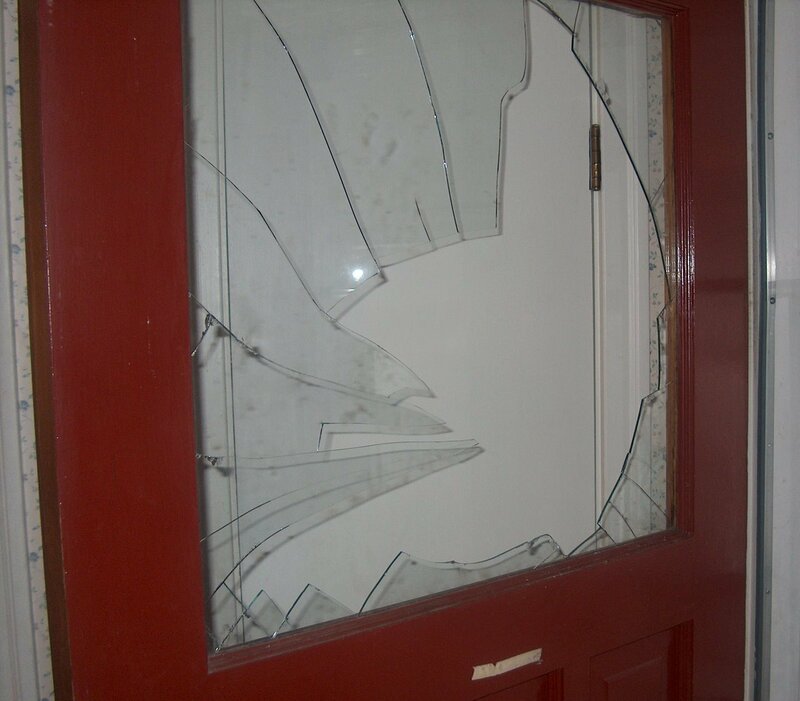 The factual context leading into the editorial is the situation faced by Susan Fentie-Pearce mother of a 14 year old autistic boy "who has become increasingly violent -- pinching, kicking, biting and pulling her hair out." Ms. Susan Fentie-Pearce claims that she sought help from her elected Member of Parliament who allegedly suggested that she should have her son charged with assault so that a judge could "order him moved to the front of the line." for placement in a group home. The Star avoided the he said-she said argument and focused on the need to for Ontario to deal with the Autism Problem and increase funding for group homes and autism treatment. 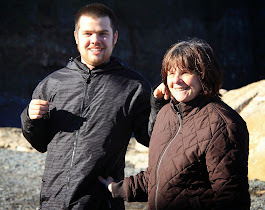 The need for autism specific group homes, with autism trained staff and centers or "villages" designed to provide a decent life for the most severely affected by autism exists in most Canadian provinces including here in New Brunswick. It is not really a choice. We can either continue to dump the most severely affected by autism disorders in psychiatric hospitals and prisons or we can provide a range of decent autism specific residential facilities to accommodate their needs when their parents no longer can. It is not a question of whether tax payer dollars should be spent on early intervention, autism specific education, community centers to assist parents or adult residential facilities. 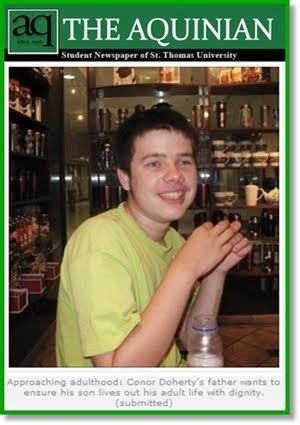 Autistic persons need help across the life span. If we do not address our minds, and dedicate adequate resources, as a society, to helping autistic youths and adults live in decent residential facilities, if we simply throw them overboard in choppy waters of difficult economic times we are not humane. 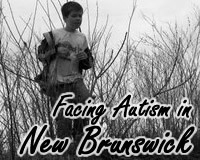 Autism In The New Brunswick Provincial Election, September 27, 2010? The New Brunswick provincial election is just underway with Election Day set for September 27, 2010. Unofficial campaigning has been under way for several months although the official campaign start date was earlier this week and resulted in several complaints that candidates had jumped the gun in erecting election signs. (For those from outside New Brunswick, a few shots I took of the New Brunswick legislature follow). There are five parties contesting the election including the governing Liberals and official opposition Progressive Conservative Party who traditionally take turns forming the government and official opposition. They are joined by the New Democratic Party which has a strong political heritage elsewhere in Canada but not in New Brunswick, the relatively new Green Party and the brand spanking new People's Alliance of New Brunswick born out of the ashes of the NB Power political firestorm that threatened to derail the current Liberal government. So far I have been unable to locate any mention by any of the parties of autism issues or commitments. It is still very, very early, and perhaps we will hear something about autism services from the parties. I do not make these comments in a negative way. Both former Conservative Premier Bernard Lord and current Liberal Premier Shawn Graham have made very substantial improvements to autism services for pre-schoolers and students. Several Ministers from both of these governments have demonstrated sincere and conscientious commitment to helping autistic children and I single out in particular former Conservative Tony Huntjens and Liberal Kelly Lamrock. In New Brunswick autism has been dealt with in a very bi-partisan manner and I am genuinely proud of our political leaders in dealing with autism issues; all the more so since I traveled to Ontario as part of the Medicare for Autism team led by Jean Lewis and David Marley from British Columbia. In Toronto where I used to work and in Oakville, next door to my son Conor's birthplace in Burlington Ontario, I met Ontario autism advocates like Barry Hudson, Norrah Whitney, Stefan Marinoiu and Jennifer O'Brien all of whom have been fighting hard against the bureaucratic stonewalling and denial of autism services and treatment of Ontario Liberal Premier Dalton McGuinty's government. Although I am proud of what New Brunswick governments have done for provision of autism services for pre-schoolers and students with autism disorders over the past 10 years I can not say the same about services for autistic adults. New Brunswick has long been in serious need of an autism specific residential care and treatment system for adults with autism. I have been part of several presentations that have been made in writing and in meetings at which concerns were pressed. In particular the need for better regulated group homes with autism trained personnel and more attention to recreational and dietary needs has been expressed. Further it is clear that a center or village capable of serving the most severely affected by autism is needed in place of the psychiatric hospital in Campbellton. I have met the professionals who operate the Campbellton hospital. They impressed me as dedicated and caring people who are doing the best they can to deal with a challenging situation and a questionable mandate of returning severely affected autistic adults to the community based group homes around the province. 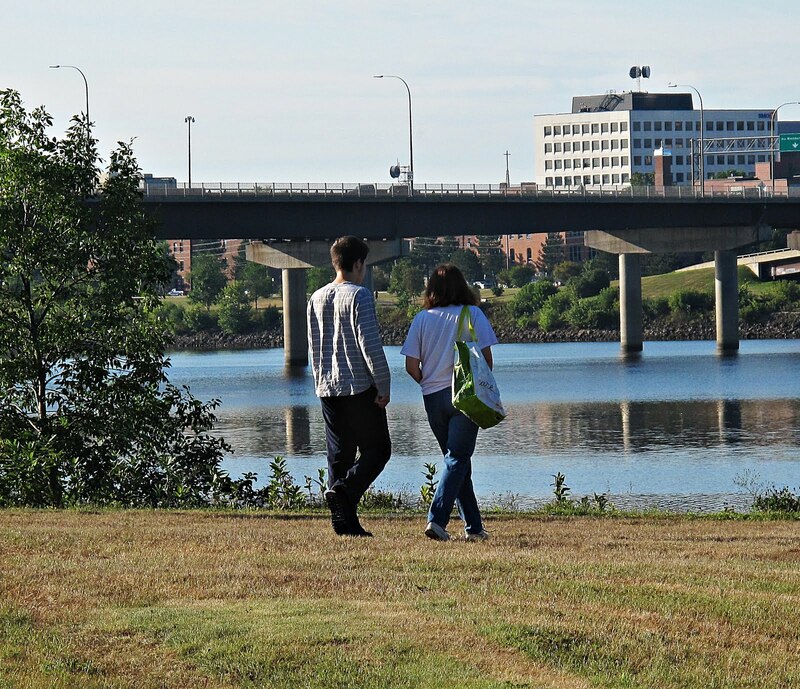 It is imperative that an autism specific facility be located in Fredericton, with its central location, and its proximity to the autism expertise available at UNB, UNB-CEL, the Stan Cassidy Center and the Board Certified Behavior Analysts that the Department of Education has brought in to replace the UNB-CEL as the primary training resource for teacher assistants working with autistic children. 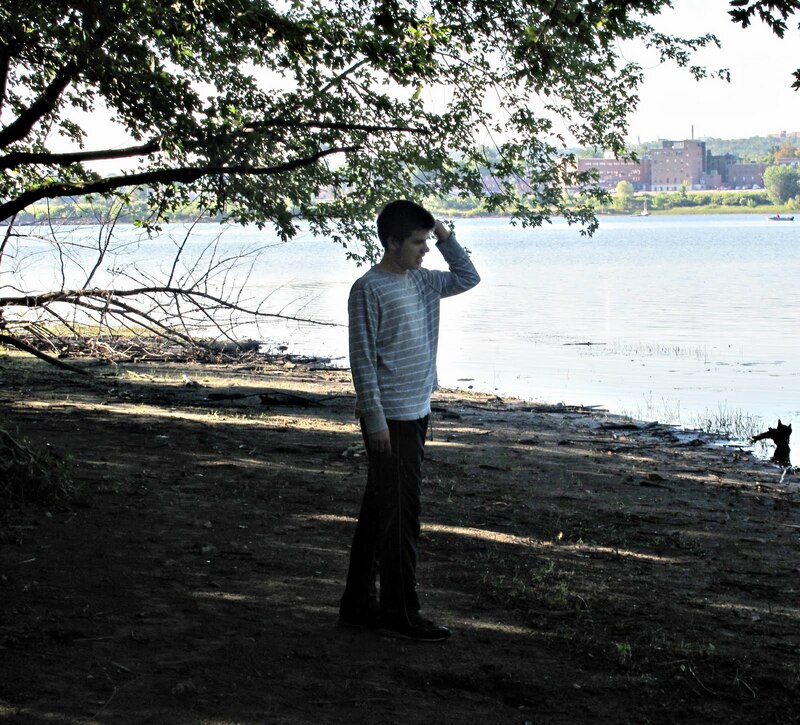 It makes no sense to locate an autism specific facility away from Fredericton and the autism expertise that has been built here over the past decade. 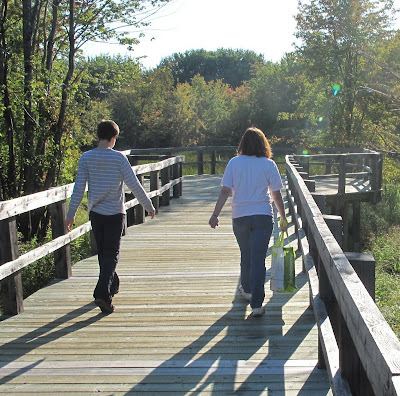 Fredericton also offers natural environments which could provide invaluable recreational opportunities for autistic adults including the incredible trails, O'Dell Park and Killarney Lake. Whatever the next government decides to do with respect to provision of modernized autism residential care and treatment for adults the current situation will not suffice. At the start of this political campaign nothing has been said about such autism services. Hopefully that will change before September 27, 2010. Today was an absolutely perfect August morning. Mom, Dad and Conor headed out early with the moon still in the sky to get some groceries. 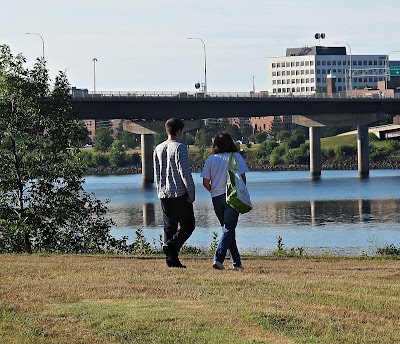 We walked the North Riverfront Trail in Fredericton, part of the New Brunswick Trails system, and enjoyed Conor's company and Fredericton's natural beauty along the way. 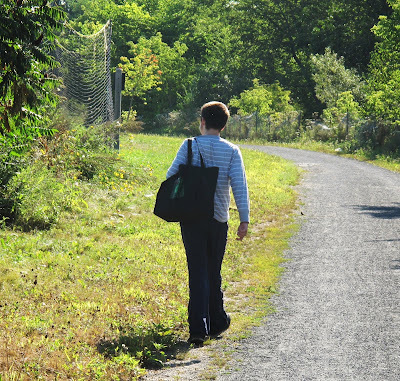 There was no autism on our minds, just the joy of each moment with Conor, as we made our way along the trail. Conor occasionally hit a quicker stride jumping in the air as he went. 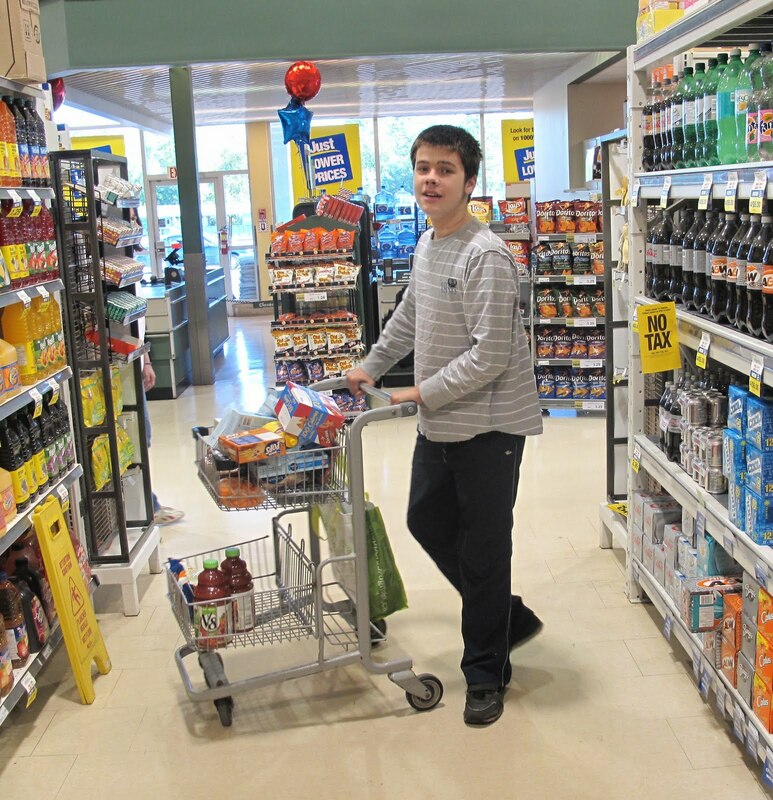 At our Superstore grocery destination Conor pitched in to help with the shopping and helped carry the groceries home. A perfect August morning. Autism and Intellectual Disability: One Synaptic Disorder Tied Together by APC Protein Dysfunction? Intellectual Disability, or Mental Retardation, or Cognitive Deficit, pick your label, pick your euphemism, pick your stigma, is officially described as a "co-morbid" condition associated with autism spectrum disorders. There are many in the "autism community", persons who have an autism spectrum disorder diagnosis, or parents who have a child with an autism disorder, who do not like any suggestion that autism disorders and intellectual disabilities are more than just co-morbid conditions, that they might be part and parcel of one disorder. 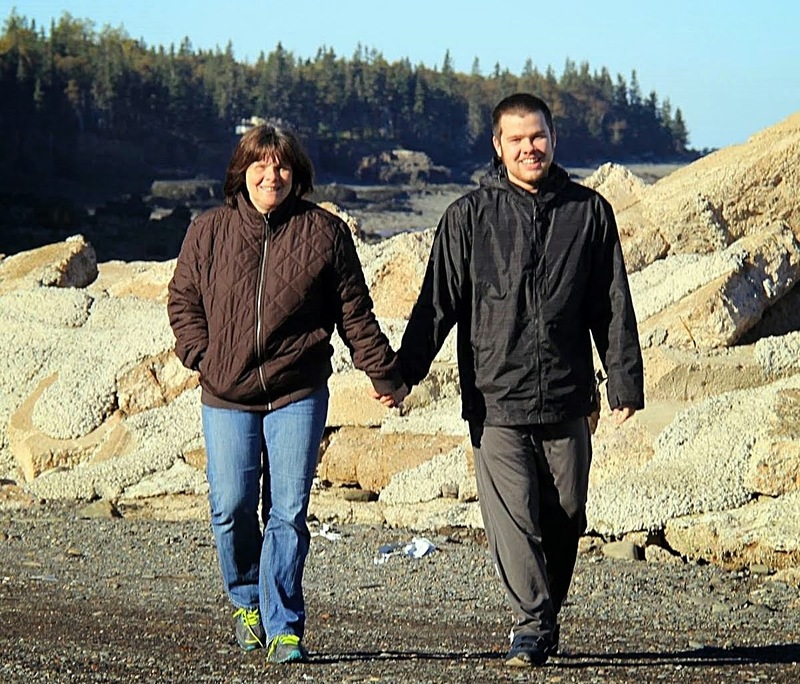 The stigma associated with intellectual disability is real and many in the high functioning autism and Aspergers community, including parents, want no part of it. BOSTON (August 23, 2010) — A clue to the causes of autism and mental retardation lies in the synapse, the tiny intercellular junction that rapidly transfers information from one neuron to the next. According to neuroscientists at Tufts University School of Medicine, with students from the Sackler School of Graduate Biomedical Sciences at Tufts, a protein called APC (adenomatous polyposis coli) plays a key role in synapse maturation, and APC dysfunction prevents the synapse function required for typical learning and memory. The findings are published in the August 18 issue of The Journal of Neuroscience. We all know that, at least when it comes to autism, the on line world is a mess. There is no such thing as a community of interests when discussing autism. There are many parents trying to make sense of what is happening with their child and his or her autism disorder. There are professionals trying to help , some with totally pure and noble intentions, others who don't give a flying fig about your autistic child who are guided by self interest or personal ideology. There are some obvious sites to be careful about when trying to find on line autism help ... the Scienceblog bloggers whose focus is in proving that vaccines can never, ever, ever cause autism or any form of neurological damage will be of no assistance to you at all and the "scientists" and "skeptics" who blog there have only a tangential interest in autism and know very little about autism disorders. The Neurodiversity bloggers who think that autism is not really a medical or mental disorder, who will try to convince you that autism is just a natural variation, a wonderful parade of joy and bliss, that autism can only be considered a disorder in the sense that autism is not accepted by society should absolutely not be taken seriously. They could well lull you into a false belief that all will be well if you just think good thoughts about autism which they have elevated into an object of worship. With all the nonsense that clutters the autism world on line where can a parent seeking to help their autistic child look to ground themselves as they being the life long struggle, and it will be a life long struggle in most cases, to help their autistic child? 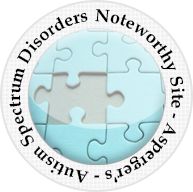 My recommendation for a starting point in the search for information is not in the autism blogs, including this one, notwithstanding that it is arguably the best informed, best intentioned and best written autism blog in the world (just kidding people). The site that I recommend as your starting point in your on line autism journey and a valuable resource at all times is the Association for Science in Autism Treatment. The ASAT logo states that if offers real science and real hope and if you are looking for real science and real hope I suggest you start at ASAT. The ASAT site is dedicated to an evidence based approach to autism treatments. The ASAT organization is thorough, balanced and well informed. It is guided by people like David Celeberti and Bridget Taylor, people who are both well educated and very experienced in actually helping autistic children. In reading the abundant materials on the ASAT site you might think it is essentially an ABA site but if you do then you are simply ... wrong. ASAT, as the name indicates is committed to real science, evidence based science. For many years ABA has been the only autism intervention that has enjoyed any substantial body of quality evidence in support of its effectiveness. If you read the ASAT comments and recommendations though you will find acknowledgments that other approaches hold some promise but require more research in to determine their effectiveness. ASAT does state point blank, but without exaggeration, that some methods are implausible and possibly dangerous and identifies those methods. Throughout the ASAT site you will find language that is respectful both towards parents and towards most efforts to help autistic children. There is a lot of helpful information on the ASAT site, it is well researched and well organized. If you are starting on the path of helping your newly diagnosed autistic child you should really consider starting with the Association for Science in Autism Treatment. NOTE: This is not a paid infomercial and I do not have advertising on this blog site. 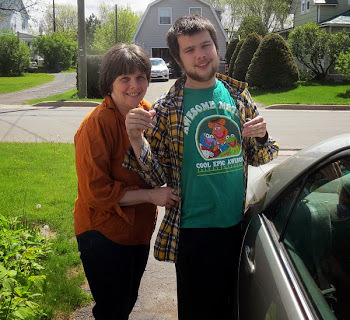 My only connection to ASAT , other than being a parent of a severely autistic son, and having read ASAT materials for many years, is that, along with some other autism parent advocates, I had the privilege of meeting David Celiberti briefly during a visit he made to Fredericton. Nor do I agree with everything on the site. The ASAT site prevalence information for Autism Spectrum Disorders, perhaps reflecting the influence of advisory board member Dr. Eric Fombonne, still indicates a 1 in 160 rate well after the CDC stated that the current rate for ASD's is 1 in 110. 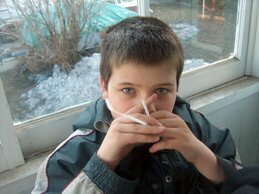 That said, the place to start looking on line for trustworthy, documented information about autism treatments is ASAT. IMHO. Though Lovaas therapy can cost tens of thousands of dollars a year, parents of autistic children clamored for it. 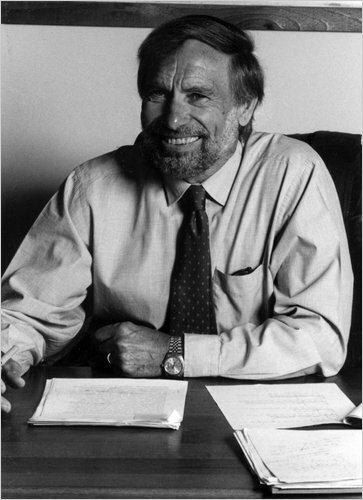 In 1995, Dr. Lovaas founded the Lovaas Institute, based in Los Angeles, which trains teachers in his method. Today, thousands of children throughout the United States and abroad are receiving Lovaas therapy. The NYT fails to demonstrate that it fully understands why the Lovaas method is so widely sought and applied by parents and others interested in actually helping autistic children .... the evidence base in support of its effectiveness. The NYT makes no mention of the numerous credible health authorities, including the office of the US Surgeon General, that reviewed hundreds of ABA studies and concluded that it is the only evidence based effective intervention for helping autistic children. Dr. Lovaas more than anyone else advanced the evidence based approach to helping autistic children that has made ABA the intervention that so many parents "clamor" for as the NYT puts it somewhat condescendingly. The evidence in support of the Lovaas ABA method is what persuaded so many parents that it was the treatment on which to wager their children's precious early development time. The evidence in support of ABA is what assisted parents in Canada and the US in advocating for the provision of treatment for their autistic children. The New York Times can not bring itself to say outright what many parents and public health authorities know ... that Dr. Lovaas was one of the very few who have actually helped autistic children. The recent expert testimony before the Children's Health Subcommittee of the US Senate Committee of Environment and Public Works covered a lot of ground in bringing to public attention the need to study environmental factors involved with causing autism and other neurodevelopmental disorders and clearly busting the myth that autism is 100% genetic. The testimony dealt with a number of potential environmental influences on neurodevelopmental disorders including autism disorders. One of the key points made in the evidence was the importance of the earliest environments, the prenatal and perinatal windows of susceptibility when a child's immunological and neurodevelopmental systems are not yet complete and are most vulnerable to developmental disruption caused by exposure to a number of environmental factors. Because of its extraordinary complexity, prenatal and early postnatal brain and nervous system development can be disrupted by environmental exposures at much lower levels than would affect adults.5,6,7,8,9 We are learning that there are critical windows of susceptibility both prenatally and in early childhood, during which the effects of exposures to environmental contaminants, depending on dose and timing, can be significantly more severe and can lead to permanent and irreversible disability.10,11,12 For these and many other reasons, EPA is especially concerned about potential effects of environmental chemicals on children’s health and neurodevelopment. Development of the nervous system begins in the womb and extends through childhood. During these periods of rapid development, the brain is vulnerable to some environmental exposures that may have the potential to disrupt the chemical signals that organize development. Even small changes in the timing of critical development events can potentially have major consequences for brain structure and function. Thus even brief exposures at these vulnerable stages can have lasting effects on adult brain function. 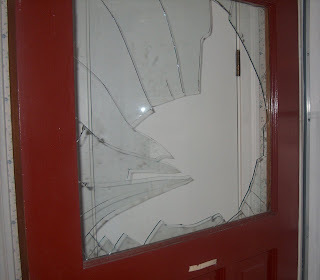 We refer to "windows of susceptibility: to mean the life stage at which the brain is exposed, during which different agents can effect the brain in specific and deleterious ways. For example, the dose of lead that is neurotoxic to an infant is much less than the dose that would be neurotoxic for an adult, so infancy in this case is a "window of susceptibility" .... Learning disabilities are on the rise in the United States and we now have a significant body of information on how exposure to certain environmental agents can affect children's intelligence quotients (IQs). For example, scientific literature attests to the effect of lead exposure in early life on IQ. ... Mercury also has been shown in multiple studies to be a developmental neurotoxicant. .... A study published last year from Columbia University showed that a mother's exposure to urban air pollutants known as polycyclic aromatic hydrocarbons (PAHs) can adversely affect a child's IQ. PAHs are released into the air from the burning of coal, diesel, oil, gas and other organic substances such as tobacco. In urban areas motor vehicles are a major source of PAHs. Children’s environmental health -- the study and prevention of disease and disabilities in children from exposures to social, physical, biologic, and chemical agents -- has emerged as a new field of research, policy, and clinical practice (Landrigan et al. 1998). The growth of this field has been fueled by the emergence of new morbidities in children, research showing that the fetus and child are particularly vulnerable to environmental influences, and mounting evidence implicating environmental exposures as major risk factors for prevalent diseases and disabilities in children (Lanphear, 2005). One in six American children have a developmental problem, from a subtle learning disability to overt behavioral disorders, such as attention deficit hyperactivity disorder (ADHD) or autism (Boyle et al. 1994; Hertz-Picciotto, 2009). These conditions can severely impair a child’s ability to succeed in school, elevate their risk for violent and criminal behaviors, and dramatically diminish their ability to contribute to society. The findings from some of the most thoroughly studied and widely dispersed environmental toxicants indicate that exposure to exceedingly low levels are risk factors for the “new morbidities” of childhood -- intellectual impairments, behavioral problems, asthma and preterm birth (Lanphear, 2005). Indeed, there is often no apparent threshold and, in some cases the effects appear to be greater at the lowest levels of exposure (England et al. 2001; Canfield et al. 2003; Lanphear et al. 2005; Yolton et al. 2005). Exposures to established environmental toxicants -- such as lead, tobacco, PCBs and mercury -- have consistently been linked with higher rates of intellectual impairment or behavioral problems, such as conduct disorder and ADHD (Needleman et al. 1990; Schantz et al. 2003; Kahn et al. 2003; Wakschlag et al. 2002; Stewart et al. 2003; Needleman et al. 1979; Lanphear et al. 2005; Yolton et al. 2005). There is emerging evidence that a whole host of new environmental chemicals – such as Bisphenol A, PBDEs, pesticides, phthalates, and airborne pollutants – are associated with intellectual deficits or behavioral problems in children, but the evidence is not as conclusive (Rauh, 2006; Engel, 2010; Eskenazi, 2007; Braun, 2009; Perera 2009; Herbstman, 2010). Much of this research was done by the NIEHS/US EPA Children’s Environmental Health Research Centers working collaboratively with the Centers for Disease Control and Prevention. Children’s developing brains are more vulnerable to certain toxicants and pollutants than adults. The central nervous systems of the fetus and young child, which are undergoing rapid changes, are particularly vulnerable to some toxicants. The fetus is a recipient of toxicants through placental transfer (Perera et al. 2003; Whyatt and Perera 1995; Bearer 2003). In some cases, such as mercury, the fetus is exposed to a larger dose than the mother (Ramirez et al. 2000). In other cases, such as organophosphate pesticides, the fetus may lack critical enzymes to metabolize environmental toxicants (Chen et al. 2003). Toddlers are often at greater risk for exposure to many environmental toxicants because they have a high degree of hand-to-mouth activity and they absorb some toxicants more efficiently (Bearer 1995). Genetic autism research has struck out. After decades of standing at the plate and swinging away with public and private autism research funding genetic autism research has provided little information about the nature of autism disorders, what causes them or possible treatments or cures. It is time to change batters and bring in significant funding for environmentally focused autism research. Hopefully public health authorities, Autism Speaks and others involved with distributing autism research funding will decide to give environmentally focused autism research it's long overdue turn at the plate. "... Although autism risk has strong heritability, no single locus alone appears to be sufficient to account for the full clinical phenotype. Results from many genomewide autism screens indicate that potential susceptibility genes are spread across the entire genome. Recently several very rare genetic mutations, single nucleotide polymorphisms (SNPs), de novo copy number variations, and epigenetic factors that influence DNA methylation were shown to contribute complexity in the transmission of autism risk. Yet genetics alone cannot account for the majority of autism cases currently being diagnosed. There is lack of full concordance between monozygotic twins, with some estimate ranging as low as 60%, and the prevalence of ASD among siblings has been reported as high as 14%. Interactions among multiple genes are likely to contribute to various types of autism, and heritable epigenetic factors and/or non-heritable environmental exposures are likely to significantly contribute to susceptibility and variable expression of autism and autism-related traits. It is therefore likely that constellations of epigenetic and environmental factors are contributing to the increasing prevalence of ASD, a rise that cannot be fully accounted for by changes in diagnostic criteria. There is a critical need to identify environmental factors, including exposure to xenobiotic chemicals and changes in diet that contribute to autism risk and severity. The vast majority of public and private resources has, and continues, to support work on identifying genetic impairments associated with autism risk. From these studies we have learned that genetics alone cannot predict the majority of autism cases, the patterns of impairments, severity, nor can they predict success for current treatment modalities. Moreover, we have learned that many of the molecular and cellular systems that are associated with autism are the very same ones that are the target of environmental chemicals currently of concern to human health because of their widespread use. Further research is needed on modifiable factors that contribute to causing or protecting against autism. It is accepted that autism is 'multi-factorial,' meaning that there are multiple factors that combine to impair brain development. Increased efforts to identify environmental factors that contribute risk to developing autism spectrum are therefore essential to improve our understanding of the constellations of genes that confer differential sensitivity to distinct environmental exposures during gestational and neonatal development. Such approaches will likely prove useful in defining subgroups of children that differ in susceptibility to specific types of environmental exposures that promote autism risk, severity, and responsiveness to clinical and behavioral interventions. We know that autism prevalence continues to increase dramatically clearly implicating environmental factors in autism risk. We must identify which environmental exposures and combination of exposures are contributing to increased overall risk in the population and identify the most susceptible groups. Only by bringing together the concerted effort of multidisciplinary teams of scientists can we identify which of the >80,000 commercially important chemicals currently in production promote developmental neurotoxicity consistent with the immunological and neurological impairments identified in individuals with idiopathic autism. 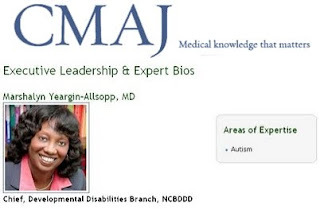 It is clear that their is a critical need to identify which chemicals in the environment that influence the same biological pathways known to be affected in autism. Limiting exposure to these chemicals is the only way to mitigate or prevent autism in susceptible individuals." The term comorbid is used to deny that there is any relationship between Autism Disorders, particularly Autistic Disorder and Intellectual Disability. The Neurodiversity ideological movement disdains any mention of Intellectual Disability in connection with "Autism" which is romanticized and its reality as a mental disorder downplayed. "Autism" research is routinely conducted using participants with Aspergers and HFA, those with Autistic Disorder and Intellectual Disability are excluded. The DSM-5 will continue the process of separating Intellectual Disability from Autistic Disorder without any apparent regard as to whether an imporant element of autism disorders ... the relationship between ID and Autistic Disorder will be ignored to the possible long term detriment to persons with Autistic Disorder and ID and to our understanding of "autism" and Intellectual Disabilities. Following are some starting sources for consideration of this important issue. Autism and intellectual disability: a study of prevalence on a sample of the Italian population. CONCLUSIONS: The study confirms the relationship between ID and autism and suggests a new approach in the study of ID in order to elaborate a new integrated model for people with ID. Definition: Autism is a pervasive developmental disorder, first identified by Kanner in 1943. Decades later, Autism came to be viewed as the more severe of the Autism Spectrum Disorders (ASD) which also include Asperger’s Disorder. ASD is a heterogeneous disorder that includes a range of developmental impairments in the areas of social skills, verbal and non-verbal communication as well as restricted or repetitive interests or behaviours. The recent "autism" brain scan study from the UK is a notorious example of an alarming reality in the world of autism research - the severely autistic are excluded from autism research. In that study autistic persons with intellectual disabilities were intentionally excluded and 16 of the 20 participants in the study actually had Aspergers diagnoses. The study press releases should have more accurately hyped the potential of the brain scan process involved to assist in diagnosing Aspergers. 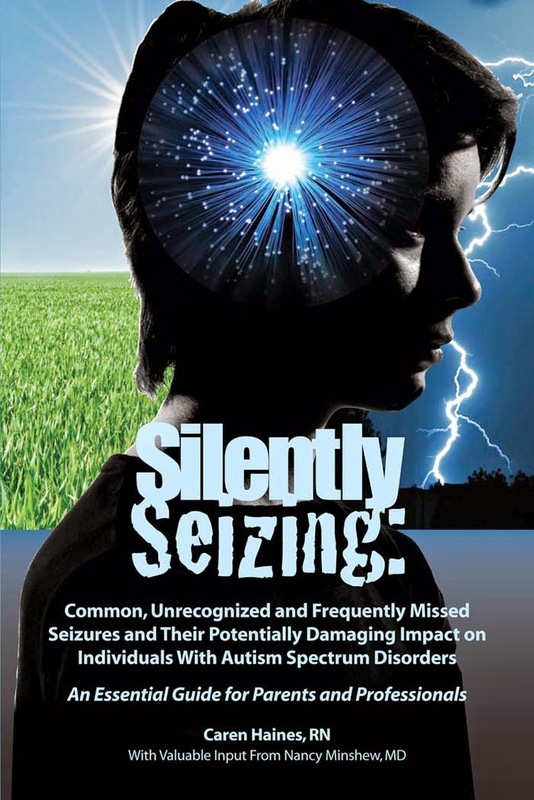 Of course that distinction will be moot once the DSM5 reduces the Pervasive Developmental Disorders to one Autism Disorder, expands the number of very high functioning persons who will be considered "on the spectrum" and removes those with Autistic Disorder and Intellectual Disabilities from the "spectrum". Aspergers Disorder will become the New Autism Spectrum Disorder in the DSM5 which will emphasize social and communication deficits but will do away with the implicit references to intellectual disability in the current DSM. The vast majority of those with Autistic Disorder today, the 75-80 % of those with Autistic Disorder who also have intellectual disabilities will, as in the research studies which have led to the New Autism Spectrum Disorder in the DSM5, simply be excluded. Is it possible for public health authorities to re-examine their rigid assumptions about autism disorders and if so how long does it take? Autism research funding has been absolutely dominated for decades by the assumption that autism is 100% genetic. The "its gotta be genetic" model of autism research funding was exposed over a decade ago by Teresa Binstock. At the same time public health authorities knew, or should have known, that autism is not 100% genetic; that environmental factors are involved. The twin studies in fact pointed to the genetic environmental model of interaction as the best model for examining autism disorders in the 1990's, as the following 1998 published abstract illustrates, and yet purely genetic research continues to be funded at approximately 19 or 20 to 1 over environmentally focused autism research. This imbalance is a scandal. Genetic and environmental influences are not mutually exclusive as causes of birth defects. Rather, both contribute to the etiology of many congenital anomalies. Recent results from studies of autism in twins argue that this is the case for autism spectrum disorders. Thus, even after the genetic causes of autism are known, it will be necessary to identify environmental factors that contribute to the expression of the symptoms. The first half of this review describes what has been learned from research on exogenous influences in autism, discussing studies of infections, inoculations, general pre- and perinatal factors, family histories, and drug and chemical exposures. The second discusses gene-environment interactions in other birth defects and the methods by which teratogens have been discovered. The role of known genetic syndromes in the etiology of autism is discussed with attention to whether their associations with the disorder are genetic or teratologic in nature. MRDD Research Reviews 1998;4:121–128. © 1998 Wiley-Liss, Inc. This autism research imbalance in the face of certain knowledge that autism is not 100% genetic is the biggest autism scandal of all and points, at best, to incompetent, rigid thinking by those who determine what autism research projects get which funding and which do not. At worst, this research imbalance has been part of a deliberate attempt to direct attention away from all potential environmental causes of autism disorders whether those causes are found in vaccines, paints, plastic products including toys and jewelry or power plant emissions, all lucrative profit generating products and activities. "Right now, about 10 to 20 times more research dollars are spent on studies of the genetic causes of autism than on environmental ones. We need to even out the funding." It is time to even out the funding and start seriously researching environmental causes of autism disorders. It is time to end autism's biggest scandal. Is Autism Epidemic Denialism Starting to Crack? Kev Leitch has reluctantly, very reluctantly, begun to acknowledge that maybe there are environmental factors involved in causing autism. For reasons that just aren't clear he calls his LBRB comment on a New Scientist article on autism increases The autism ‘epidemic’ no more even though the article does not provide any evidence to support the conclusion asserted in that title. In the New Scientist article Autism explosion half explained, half still a mystery Jim Giles reports that Dr. Peter Bearman and colleagues at Columbia Unviersity conducted a three year study and found that only approximately half of the startling increases in autism diagnoses can be explained by diagnostic change, increased awareness and increased parental age. But now a series of a studies have shown that diagnostic changes alone cannot account for the increase. They suggest that other causes, perhaps environmental factors, are also contributing to the rise in cases. "These studies give me the feeling that there must be a true increase in the number of children affected," says Tom Insel, director of the National Institute of Mental Health in Rockville, Maryland. "Autism used to be highly stigmatised, in part because it was thought to be due to poor parenting. The removal of that stigma has made doctors and parents more willing to recognise the disease, which will have contributed to [some of] the extra cases, says Roy Grinker, an anthropologist at George Washington University in Washington DC. This and other social causes, together with uncertainty in the number of cases that can be attributed to the factors already studied by Bearman, could account for much or all of the unexplained half, says Grinker." The article does not explain what Professor Grinker meant by the "uncertainty" in the number of cases that can be attributed to the factors already studied by Bearman and his colleagues who studied these cases over a three year period and explained roughly half of the increase on diagnostic change and awareness. To my knowledge Grinker has not conducted a similar lengthy or extensive study to substantiate his "stigma" theory that autism is not really increasing. "So what can we take from Bearman’s work? In my opinion we can take the fact that as soon as the questions regarding non-environmental causes were actually looked at and studied, there were numerical values that could be applied to their contribution. There are other non-environmental causes which Bearman didn’t look at which would probably be found to contribute to the other half. What about the alleged environmental causes? It would not surprise me in the least if it were found that there were some." From that observation we then go back to the title of Leitch's comment "The Autism Epidemic No More" which makes absolutely no sense at all in light of the Bearman study, the New Scientist article or Leitch's own painful acknowledgement that environmental factors might be involved in explaining the increases in autism diagnoses. Autism epidemic denialism is beginning to crack but it is a painful process for those, like Roy Grinker and Kev Leitch, who have been loath to admit that environmental factors are involved in causing or triggering autism disorders. Perhaps Professor Grinker and Blogger Leitch will have less difficulty accepting the role of environmental factors in causing autism if and when the grotesque imbalance which favors genetic autism research over environmental autism research by 19 or 20 to 1 is eliminated in favor of more balanced distribution between genetics and environment. Perhaps then they will see the Autism Epidemic that has been staring at us in recent years. In BRIAN S. v. DELGADILLO, the Court of Appeals of California, Sixth District, in a decision filed July 28, 2010, and reported on line at LEAGLE, dismissed an appeal by a claimant with an Aspergers Disorder diagnosis who had been denied services by a regional center. The appeal involved a number of evidential and procedural issues and the weighing of contrary professional psychiatric opinions. Amongst other findings by the court was the conclusion that "autism" as used, but not defined, in the applicable statute did not include Aspergers Disorder. The court also concluded that "autism" as used clinically refers to the diagnosis of "Autistic Disorder" in the DSM-IV-TR but not to Aspergers Disorder. "Claimant argues that these publications reflect recent trends showing that the DDS, through its regional center system, provides services to individuals with Autistic Spectrum Disorder, including those with Asperger's Disorder, on a case-by-case basis, provided that the individual is substantially disabled by the condition, as that term is defined in section 4512, subdivision (l). The amici curiae also rely on these studies and guidelines in pressing their claim that the current use of the term autism in the mental health community describes a range of disorders known as Autistic Spectrum Disorder, which includes both Autistic Disorder and Asperger's Disorder. It appears from these materials that increasing numbers of people seeking services in the regional center system are presenting with various forms of Autistic Spectrum Disorder, as described in the Best Practice Guidelines, and that there is an emerging need to clarify the eligibility requirements under the statute. However, while claimant and the amici curiae have impressed upon us the importance of these issues, we must reject their arguments, for several reasons. First, contrary to what the amici curiae argue, the materials before us by no means reflect a settled consensus in the scientific community regarding the use of the term Autistic Spectrum Disorder. We note that the authors of the Best Practice Guidelines point out that Autistic Spectrum Disorder, as used in the Guidelines, is a descriptive term, and is not meant to be a diagnosis. The authors defer to the authority of the DSM-IV-TR as the current standard, which classifies Autistic Disorder and Asperger's Disorder as two separate disorders. The amici contend that the newest edition of the DSM will reject any distinction between the two disorders and has formally recognized autism as a spectrum disorder. However, this new edition of the DSM (DSM-V) is in the preliminary draft stages only and will not be published in final form until 2013. Furthermore, even among those professionals who advocate using the descriptive term Autistic Spectrum Disorder, there is disagreement as to which pervasive developmental disorders should be included in the term. (See Caseload Update, p. 6, ["[b]oth nationally and within California, there is not total agreement on which diagnoses should be included as part of the spectrum."].) And there is controversy around the spectrum concept itself. 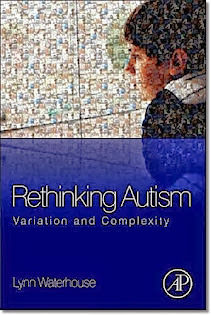 (See Best Practice Guidelines, p. 147 ["the assumption that all of the conditions on the so-called `spectrum' represent some variant of autism remains a hypothesis and is not an established fact."].) In sum, resolution of what appears to be an unsettled debate in the psychiatric community as to whether autism should be re-classified as a broader Autistic Spectrum Disorder involves clinical, rather than legal, determinations. Second, Claimant's argument that the DDS has endorsed a definition of autism to mean Autistic Spectrum Disorder, thus including Asperger's Disorder, is directly contradicted by the DDS itself, which has filed a brief in this appeal in response to our granting of Claimant's request for judicial notice. The DDS has clarified that it has "not issued any formal interpretations of `autism' under section 4512, subdivision (a)." The Best Practice Guidelines itself cautions that it offers only recommendations, and "cannot be interpreted as policy or regulation." 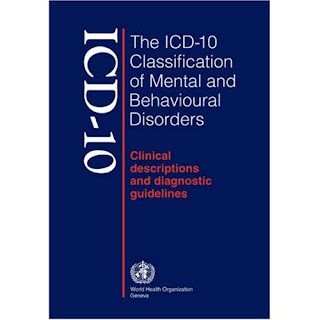 The DDS, and the authors of the Best Practice Guidelines, continue to accept the definitions in the DSM-IV-TR as current authority. The Caseload Update, prepared by the DDS, equates autism with Autistic Disorder and does not include in its data "people with other disorders on the spectrum," such as Asperger's Disorder. It provides that "[f]or the purpose of this report, the term `autism' refers only to the condition characterized by the [DDS] as `autistic disorder' [as defined in the DSM-IV-TR]." The position of the DDS is clearly stated in its brief: "`[A]utism' under the Lanterman Act should be interpreted to mean `Autistic Disorder' as defined under the DSM-IV-TR, and accordingly should not include Asperger's. "[ 6 ]"
"It is argued that individuals who have been diagnosed with Autistic Disorder and those with Asperger's Disorder may be equally disabled and similarly in need of services. Thus, there is no reasonable basis to find some individuals eligible for services and to exclude others, except on a case-by-case assessment of their level of disability. We understand, and are sympathetic with, the argument that services should be available to all individuals with substantial disabilities. However, the Legislature has specifically limited the categories eligible for services under the Lanterman Act. And Autistic Disorder and Asperger's Disorder, although they have characteristics in common, are presently distinguished by the diagnostic criteria set forth in the DSM-IV-TR. With Austistic Disorder there are more severe communication deficits not found in people with Asperger's Disorder. With Autistic Disorder diagnostic symptoms are obvious in early years, and may include mental retardation. Those with Asperger's Disorder exhibit no cognitive or language delays. These differences describe a greater severity of deficits in people with Autistic Disorder and provide a reasonable basis for the regional center system serving that population. And, as the record shows, people with Asperger's Disorder are served through the mental health system." As noted above, the court noted some important distinctions between Autistic Disorder and Aspergers Disorder including diagnostic differences related to severe communication deficits in persons with Aspergers Disorder which are not present in Aspergers, the fact that Autistic Disorder symptoms are obvious in early years, the fact that mental retardation may be present in Autistic Disorder and the fact that those with Aspergers Disorder do not show cognitive or language delays. The California appeal court in this case expressly stated that persons with Aspergers can also suffer from deficits but they are different in kind and severity from those which accompany Autistic Disorder. I have made this observation many times on this site. Given that the DSM is the primary clinical tool in North America for assisting in the diagnosis of what are described as mental disorders which impact on the functioning abilities of those with various DSM diagnoses why on earth are the DSM5 committees combining the two together into one New Autism Spectrum Disorder? 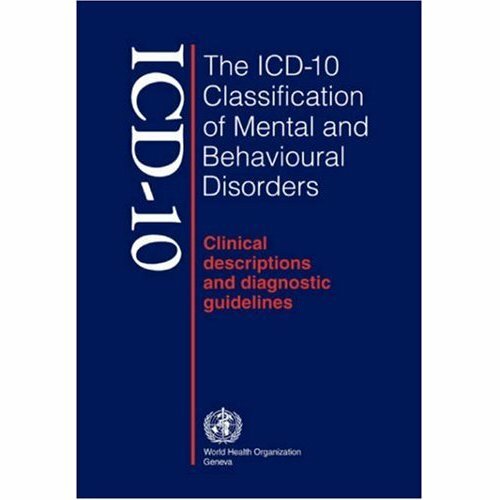 How does this obscuring of important differences in functioning areas and severity levels in the authoritative diagnostic manual help persons with either disorder? I have often written of the major mainstream media institutions glossing over the harsher realities of autism disorders as experienced by those with severe Autistic Disorder. 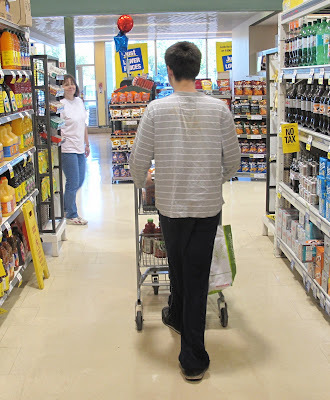 One of my friends, a determined autism dad/advocate from British Columbia, re-posted on Facebook an exception to this tendency and I thought it appropriate to mention again this realistic coverage of the challenges faced by a severely autistic adult. "Noah, my younger brother, does not talk. Nor can he dress himself, prepare a meal for himself or wipe himself. He is a 42-year-old man, balding, gaunt, angry and, literally, crazy. And having spent 15 years at the Fairview Developmental Center in Costa Mesa, Calif., a state facility, Noah has picked up the con's trick of lashing out before anyone could take a shot at him. Despite the successful marketing of the affliction by activists and interest groups, autism is not a childhood condition. It is nondegenerative and nonterminal: the boys and girls grow up. For all the interventions and therapies and the restrictive diets and innovative treatments, the majority of very low-functioning autistics like Noah will require intensive support throughout their lives. If recent estimates of prevalence by the Centers for Disease Control and Prevention are accurate, then 1 in 150 of today's children is autistic. That means we are in for a vast number of adult autistics — most better adjusted than Noah, some as bad off — who will be a burden to parents, siblings and, eventually, society. We are largely unprepared to deal with this crisis. ..."
There are some who can flippantly ask ... autism crisis ... what crisis? Karl Taro Greenfeld is not one of them. 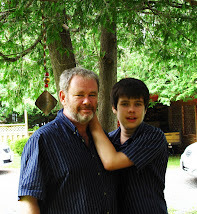 Nor am I as the father of a 14 year old boy severely affected by his Autistic Disorder. 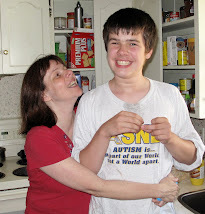 In our house the Autism Crisis is very real and never out of mind. 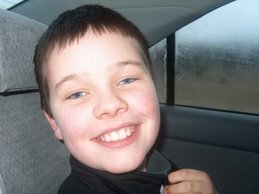 I was once very impressed with Autism Speaks. 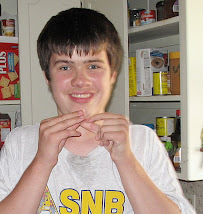 My son Conor, with Autistic Disorder, severely autistic, wore an Autism Speaks cap and my vehicle had an Autism speaks sticker near my licence plate. In the ongoing struggle by parents pushing for a cure for autism disorders Autism Speaks was a powerful voice. It now looks, increasingly, as though Autism Speaks has become at best a professional charity seeking to placate all without any consideration given to its guiding principles and how they are impacted by some of those they embrace with open arms. Two of those with whom Autism Speaks engages are Jon Elder Robison and Alex Plank both of whom oppose the concept of curing autism which is, in theory, one of Autism Speaks guiding principles. Mr. Robison to his credit is generally polite, if disdainful about curing autism. Mr. Plank however hosts a forum, Wrong Planet, in which anything goes in attacking people seeking to cure autism. 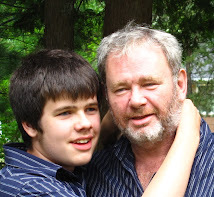 This father of a 14 year old son , severely affected by Autistic Disorder, no longer hears his voice when Autism Speaks.